Alaska is not all snow and rugged mountains. They do have rolling hills and greenery! This amazing Alaskan destination wedding was in June of 2016! It was always on our bucket list to photograph a wedding in Alaska. We never knew the temperature could be be in the high 60's either! Neal was in shorts! Sheryl and Rob flew us to Alaska to photograph their wedding. We put together a wedding package that would include multiple photo shoots. We had to take advantage of the breath taking scenery when we were there. This image was taken at about 11:00 at night. We were there in June, so there was really no night time. This was considered dusk. It never got dark. This meant we had a longer time to take photos and not worry about losing the sunlight! Bonus! This was a last minute stop too! We were heading back to the hotel in Wasilla, after shooting in Anchorage, when Sheryl and Rob mentioned Flattop Mountain in Anchorage. They said it had an amazing view and thought we would love it for photos. If they were still up to shoot for a little bit longer, we were in! We were in awe when we got to the top. The view was amazing! We still were in shock that the sun was just setting around 11:00pm. We only needed a simple pose here too. The scenery and natural back drop had enough wow factor! Time for Sheryl and Rob to get nice and close. That was it! We did need some added light to the front of them, but the back light was perfect! The rays from the sun were gorgeous. We still think about this image over a year later and can't believe this was 11:00pm! 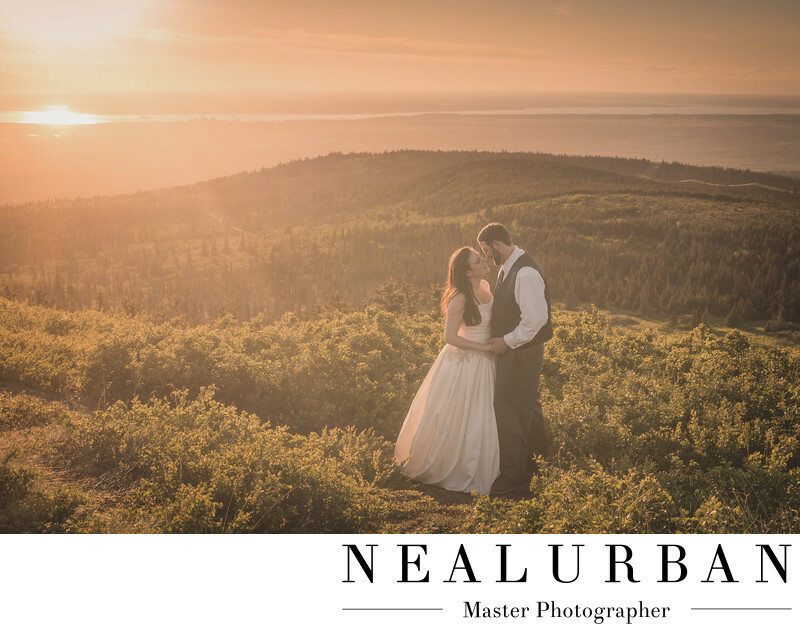 We could not have asked for better locations or couple to photograph in Alaska! Location: Flattop Mountain, Anchorage Alaska United States.